All original spare parts by KSB are manufactured to the highest standard either in-house or through class-leading OEM component suppliers. They help reduce energy consumption and prevent downtime. To avoid downtime, KSB service processes all orders quickly and to the full satisfaction of its customers. Many spare parts are even dispatched within 24 hours of receiving an order. 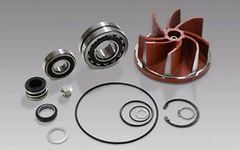 KSB offers advice on all aspects of spare parts provisioning and optimum maintenance cycles. This allows you to take advantage of useful modifications and innovations. We are active in research and development to make your system is not only reliable but also future-proof.